Today marks the 3rd year anniversary of starting my droid! 3 years ago today I sent off for my first parts. Some 20 months later the droid was complete. Now I am fast approaching a time when I will have been a droid owner longer than I was a droid builder. If you ever hear that "building is the fun part", you aren't talking to someone who's finished. Having the completed droid at events and conventions is definitely the most fun for me. Over the past year, I've had a lot of fun with the droid: I've done two Star Wars Concert Events, one as part of the official tour, another a special engagement in Cinciannti. I've done a few cons; GenCon in Indianapolis and DragonCon in Atlanta. Both times the droid has provided opportunities to meet new people and celebrities. On the parts front, 2009 was the year we offered the Laser Cut C&D Dome. I've done some upgrading too. A new dome motor was needed. I will also finally be getting some real logics in my dome. 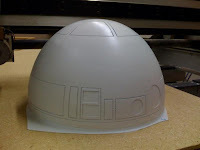 Daren Murrer and I hosted a great Droid Builders Day in Cincinnati back in May. I think we need to start thinking about the next one very soon. By then, I hope that I've made more progress on the second droid!